Soldier Honored: Larry J. Bauguess Jr.
Placed 18th at CAA Championships (73-72-72=218) in Midlothian, Va. Participated in Patriot All-America Invitational (Story). 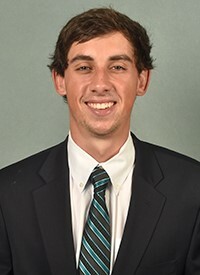 Competed as individual at NCAA Regional in Franklin, Tenn.
All-CAA first-team selection and finished fourth at CAA Championships in Southport, N.C.
Posted season-low tournament of 212 (70-72-70=212) at Primland Intercollegiate (9/29-30/14).